Sugar Gliders are sexually mature at 12-14 months of age. Some may reach sexual maturity at around 8 months of age. 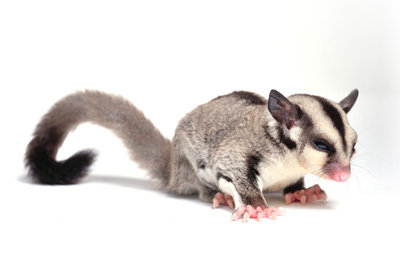 Sugar Gliders breed year round and will mate often. The male will hold on to the female’s back with his front feet to keep her from moving during mating. Sugar Gliders can have two or three litters a year and a litter usually produces one or two babies. Gestation takes about 15 to 17 days. After the female gives birth, the extremely tiny babies will climb to the mother’s pouch. It takes about two weeks for the baby to be noticeable in the pouch. The baby will come out of the pouch in about 6 weeks. They will be ready to wean when their eyes have been open for 3-4 weeks and will then be ready to move to their own cage away from their parents. Once the babies have their eyes open, you can handle them for short periods. Sexing your glider is easy. Female gliders have a pouch on their stomachs and males will have a small furred scrotum. Males will also have a visible diamond shaped bald spot on the top of their heads. This is a scent gland and absent in the female gliders.